Days after condemnation from fans and supporters, Nollywood actor Jim Iyke has received a brave commendation from his colleague, controversial Nigerian actress Tonto Dikeh. 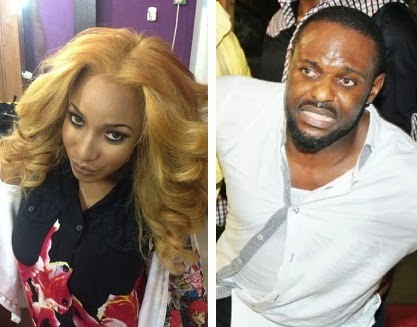 Apart from Camilla Mberekpe and Jim Iyke, Tonto Dikeh was another Nollywood celebrity who claims TB Joshua led her to christ and delivered her from smoking addiction. Her conversion claim became doubtful when she almost killed herself few weeks ago. It’s only God that saved her. just saw tonto’s knees and her recent colour isnt hers.she must have bleached……. i just saw tonto’s knees,her recent skin colour is not hers,she must have bleached. Birds of the same feather, flocks together…. Hey, Bezo! U dnt talk 2 ppl lyk dat. let me see if he will not smoke in his life again. cuz eyes are watching him with his formal life now. let him be born again now. and work in light of holiness life. if he fail to do so. many demons are awaiting!!! Jim iyke im proud of u, i jt pray God protect n guide u. d decission u took ws d rite 1, delivrance itz wat evrybdy nids nw. Wit tym u guyz will cm in terms wit dis fact. U shld stp condemin d scoan, let d lord judge cos he’s d only 1 dat cn see beyond.